If you're looking to improve your stakeholder engagement for your project, you need to market it. One way is to distribute printed materials like postcards or flyers, but how do you make it easy for people to go to your project website when they will have to type in the address manually? This blog will explain how to use a link shortener to make your URLs clean and concise so your audience can easily get to your project's website. 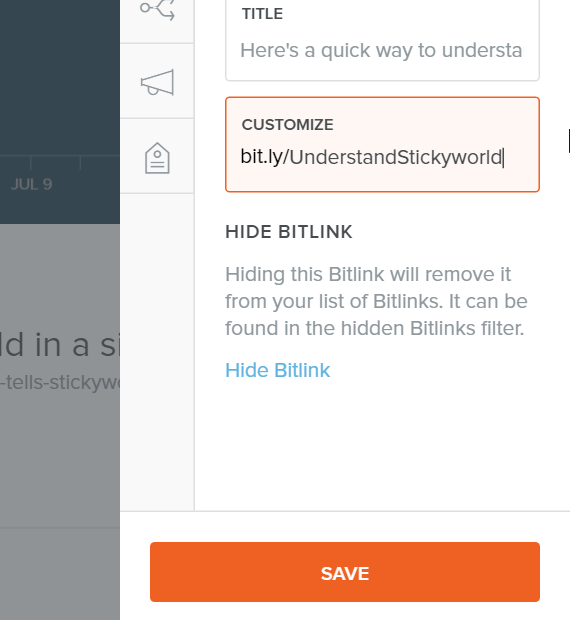 Bitly is a service that lets you take a long URL such as: https://info.stickyworld.com/blog/superb-illustration-by-future-cities-catapult-tells-stickyworlds-story and lets you shorten it for ease in typing manually - if you're distributing physical content like mailers for example. The above link will become http://bit.ly/UnderstandStickyworld and by creating a free account on Bitly, you'll also be able to track when people visit for the first time from that URL. Step 1: Go to Bitly.com and sign up for a new account. Note that the URLs are case sensitive - they must be typed by your audience exactly as they are written. As an added bonus, Bitly also counts the first time a person navigates to your site with this URL, allowing you to measure traffic. Note that it will not measure duplicate visits from the same person. You're now ready to start using shortlinks to measure your real-world marketing activities. Good luck! If you're curious about how Stickyworld can help your organisation or your project, please request a demo.